Greenlawn Cemetery in Columbus, Ohio is a beautiful and historic cemetery that is well known as a great place for birding and seeing a variety of trees. I was there this morning with my Human Biology class, doing a lab activity called “Cemetery Demography” that constructs life tables based on birth and death dates for people born in the 1830’s versus those born in the 1880’s. While the students were recording data, I snapped some pics of plants. 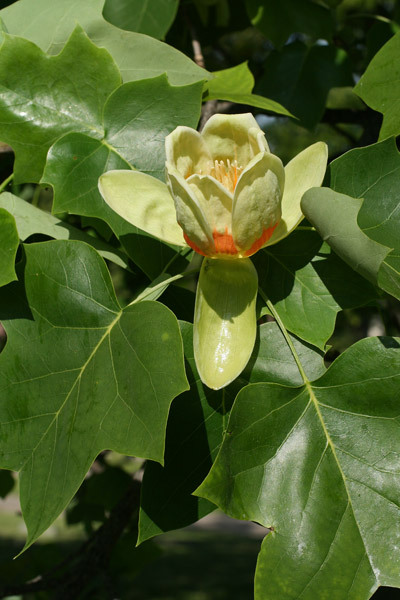 The tulip-trees (Liriodendron tulipifera, family Magnoliaceae) are in full flower. 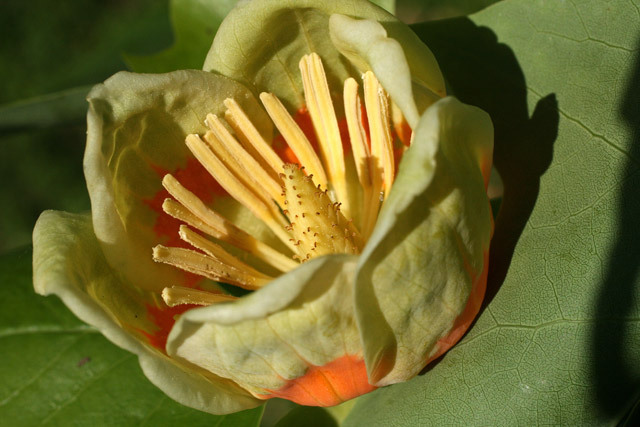 The flowers of Liriodendron are much like those of Magnolia, and are generally regarded, along with buttercups (family Ranunculaceae) and water-lilies (Nymphaceae), to be among the most primitive flowers. This can be conceptualized by recognizing that flowers are basically modified branches and that flower parts –sepals, petals, stamens, and pistils –are modified leaves on those branches. 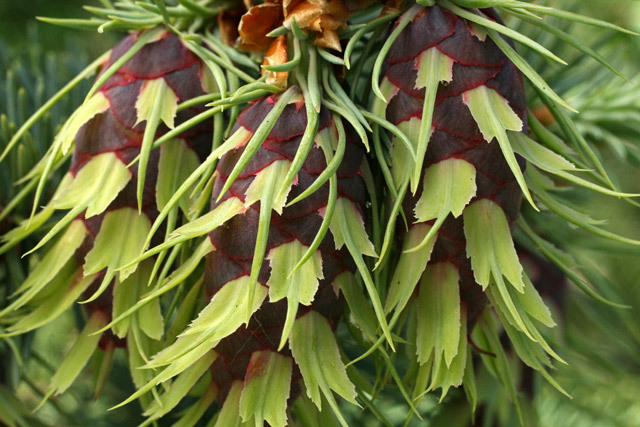 The flowers that most resemble a branch with leaves are regarded as most primitive. 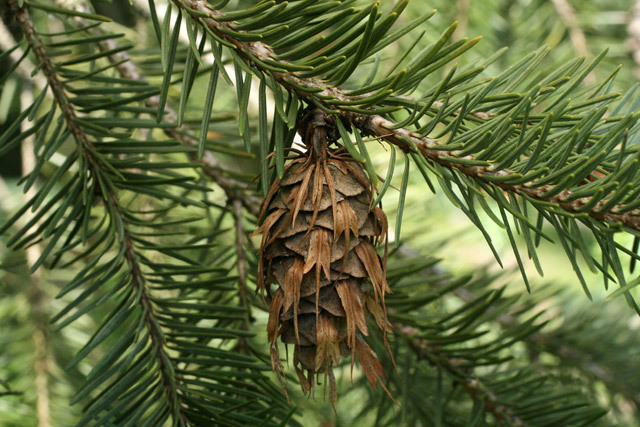 The made-up word “FENSH” is a guide to the features of primitive flowers. “F” signifies “FREE,” as the flower parts are separate (free) from one another, i.e., they are not fused. “E” stands for “EQUAL,” as the flower parts within a series are the same size and shape. i.e., the flowers are radially symmetric. “N” means the flower parts (not the flowers themselves) are NUMEROUS. “S” is for “SPIRAL,” as the numerous flower parts are spirally arranged. Notice in the tulip-tree blossom. how the flower parts are separate, all the petals are the same size, the stamens are numerous and spirally arranged, and the pistils (which are also numerous and spirally aranged) are the topmost features. A FENSH flower, primitive. 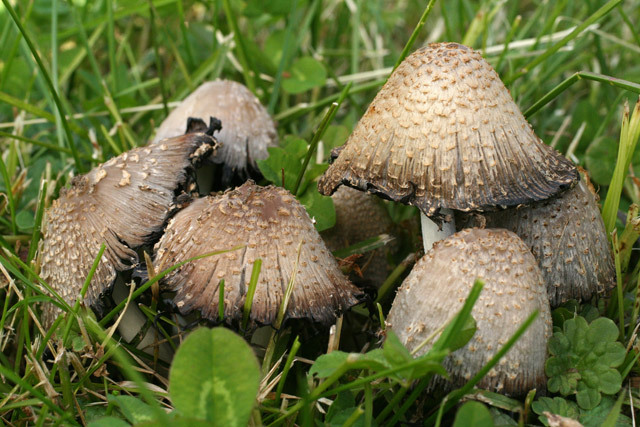 Covering a large stump sawed-off level with the ground and also scattered in the lawn nearby is an “inky cap” mushroom, in the genus Coprinus, maybe C. atramentareus. 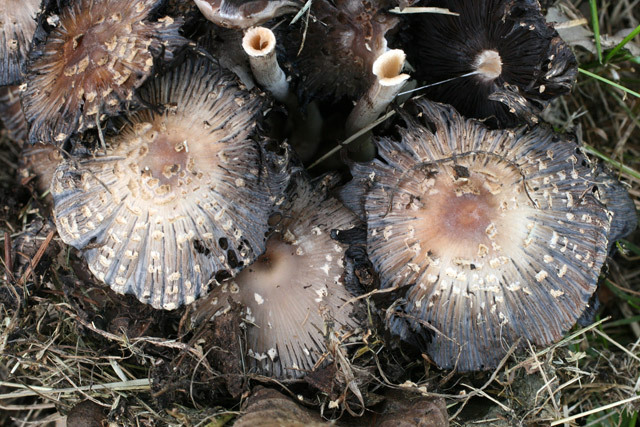 The inky caps have closely spaced narrow black gills that decompose into black liquid as (or perhaps after) they mature. Inky-caps (genus Coprinus) at Greenlawn Cemetery, May 23, 2008. 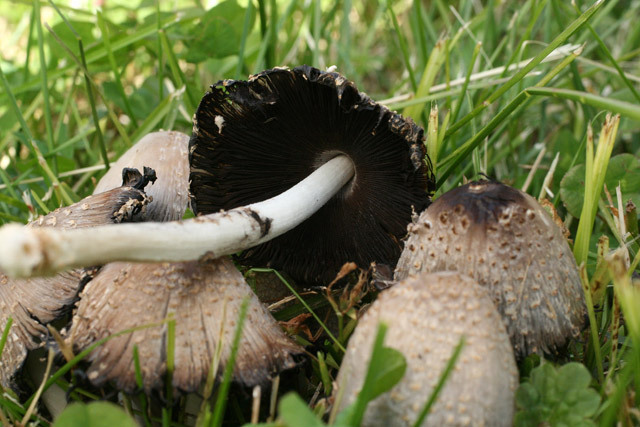 Inky-cap (genus Coprinus) have closely spaced narrow gills. Before they go “inky,” the inky caps are edible, but some, such as this one, have an unususal side-effect. When consumed with alcohol, the result is intense nausea. This is caused by a chemical in the mushrooms related to the pharmaceutical medicine “antabuse,” used to treat alcohol dependency. In Columbus (and elsewhere no doubt) a few small native woodland wildflowers have established themselves as lawn weeds. Spring-beauty, (Claytonia virginiana, family Montiaceae) is a good example. 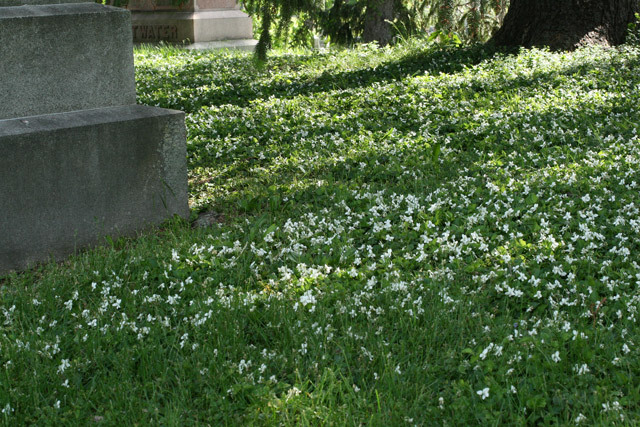 Several species of violets too grace lawns in some places. 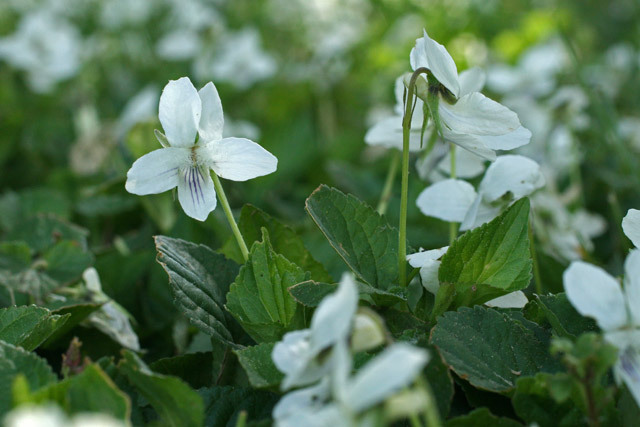 Here at Greenlawn, the striped creamy violet, Viola striata (family Violaceae) is especially abundant.